1964 Ford Thunderbird - Same Family Since New! 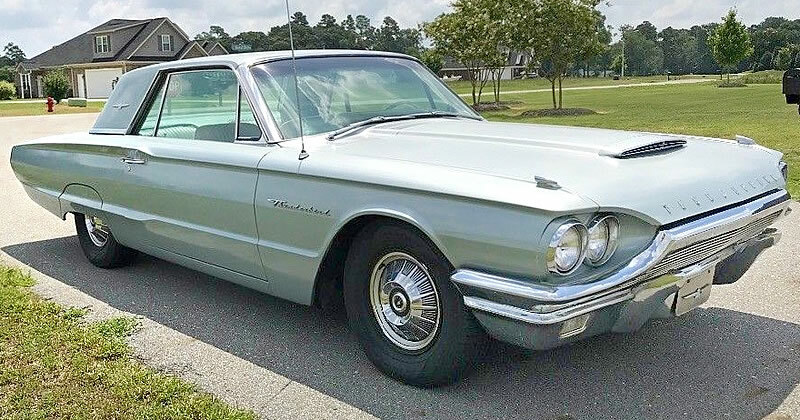 The 1964 Ford Thunderbird was equipped with a 390 cubic inch (6.4 liter) V8 with Cruise-O-Matic automatic transmission - both were standard in the T-Bird. 1964 saw Ford restyling the Thunderbird, it was the fourth time since its introduction in 1955. It had actually seen slow down in sales during 1963 and the new look for '64 resulted in a further 30,000 sales. This new fourth generation had a more squared off appearance. This was particularly evident from the rear. Note too the departure from round taillights to square ones. Check out those taillights with the Thunderbird emblem! The front end had a more aggressive look and the hood now featured a new scoop (power dome) on the top. 'Thunderbird' was now featured in script on the front fenders behind the front wheels. We now saw THUNDERBIRD spelled out in letters across the front of the hood, rather than the emblem that adorned the 1963 models. New, more aggressive front end with power dome on the hood. 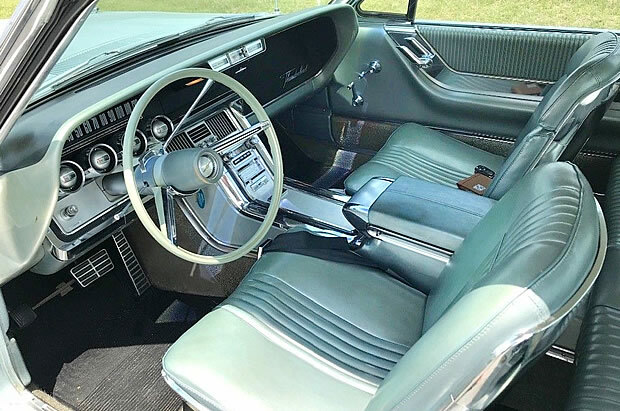 Ford described making the new Thunderbird for 1964 more luxurious by; creating a jet-age cockpit up forward with flight-deck panel and instrumentation.... new shell contour seats to cradle driver and passenger in supreme comfort... a new console topped by padded arm rest. Ford produced 60,552 Thunderbird 2-door Hardtops for the 1964 model year. The base price came in at $4,486. This particular Thunderbird has been in the same family since it was new. 1964 was the first and only year THUNDERBIRD was spelled out on the bonnet [ hood ] the 1964 -1966 model was the last year a Thunderbird was a real car . the following years were rubbish. Absolutely correct had a 61 convert , 64 Landau , 66 2 door and the 65 Special Landau . they were the best the rest were ugly like all new cars in todays word stupid looking .